s-ley@hotmail.co.uk or tel: (01752) 214807. DISCLAIMER: Any opinion expressed and advice offered in this website is not necessarily that of the Federation or its officials and no responsibility can be accepted for the results of following contributors' advice. 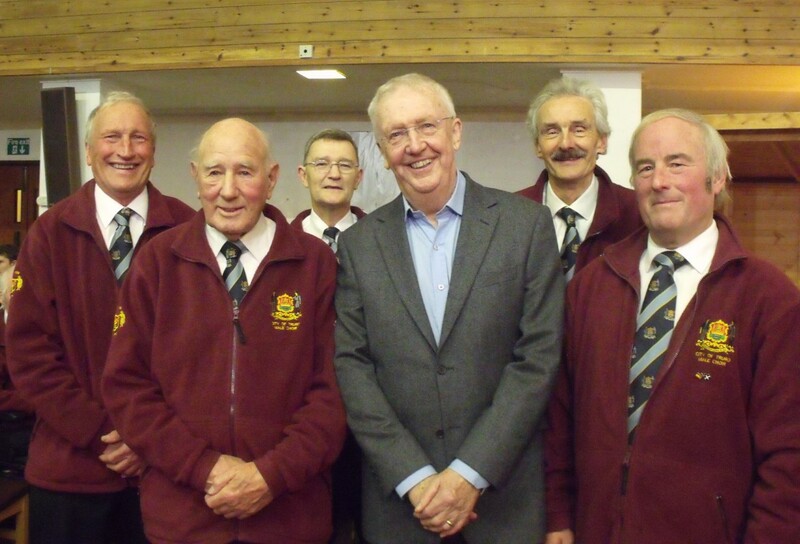 On Thursday 7th March Burraton Male Choir had their first concert of the year. The concert was held at Saltash Wesley Methodist Church and a most enjoyable evening was had by all. Special guests at the concert was Grace Notes Acapella, a Ladies Acapella Chorus based in Saltash singing four-part harmony in the barbershop style. 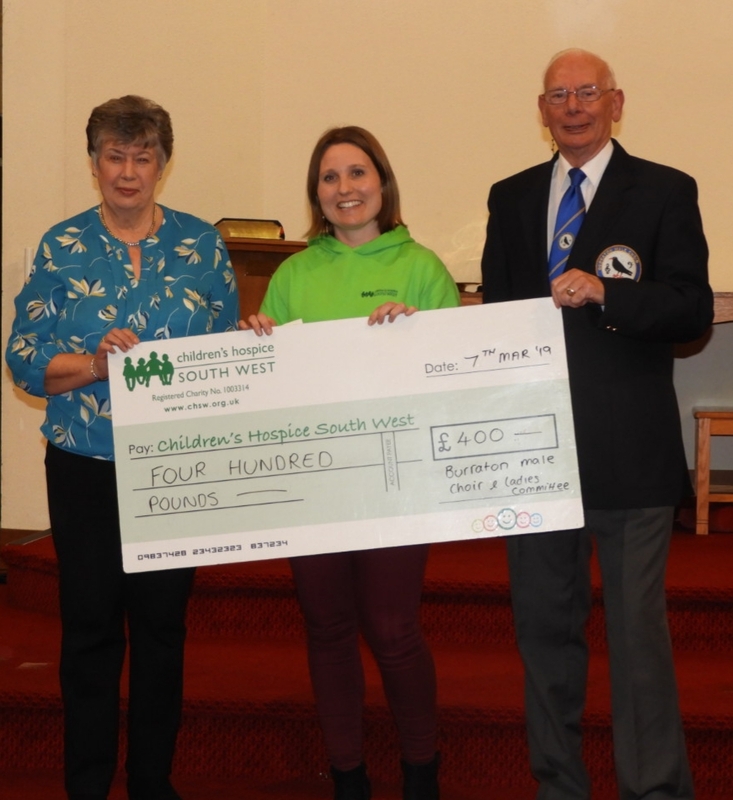 The evening was compered by Radio Cornwall's Donna Birrell and Sheila Pender secretary of the Burraton Ladies Committee presented a cheque for £400 to Children's Hospice Southwest. The evening ended with everyone enjoying a Cornish supper laid on by the Ladies Committee. 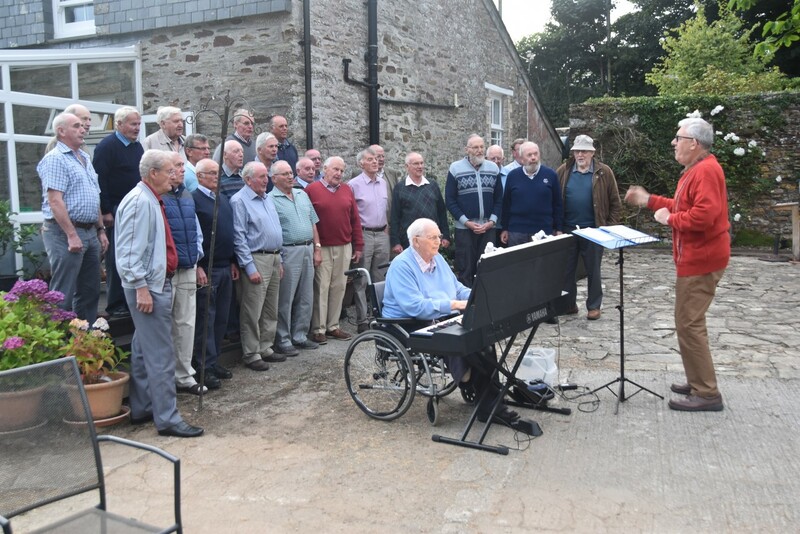 THE Rame Peninsula Male Voice Choir is helping a project to prevent the demise a 13th century bell tower in East Cornwall. The Maker Ringers, who use the tower for weekly practice, and perform there at services, weddings, funerals, and to celebrate national events, have already contributed £2000 to kick start their "Appeal to keep Maker bells pealing" for generations to come. 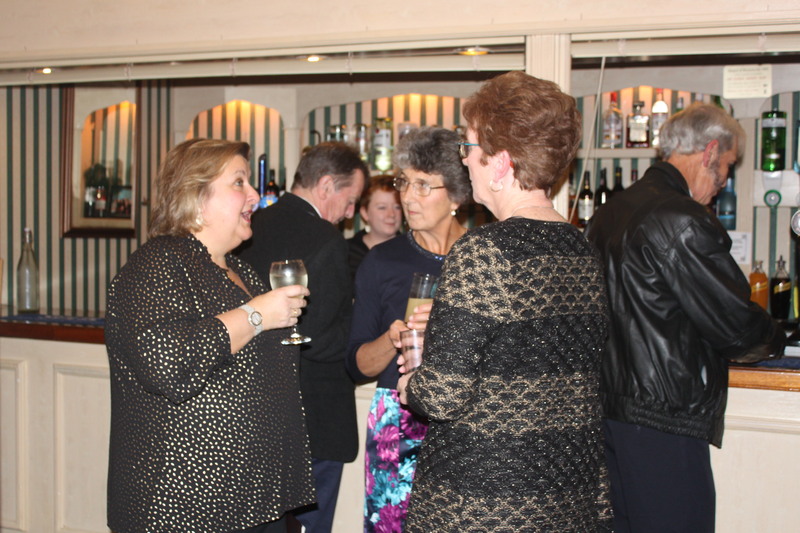 Fund-raising events are planned and potential grants are being explored. 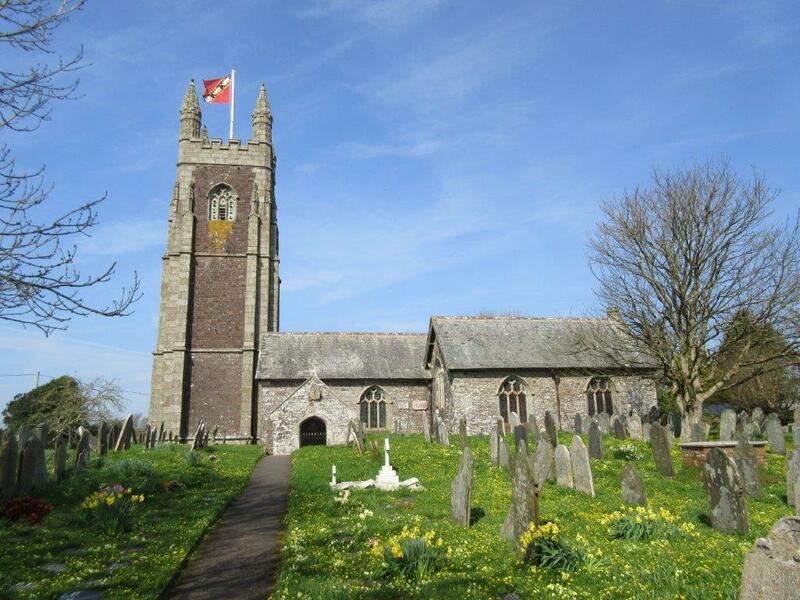 The Church of St Mary and St Julian at Maker has perched upon the high ground above Mount Edgcumbe for almost 900 years. From its iconic 13th century sandstone tower the bells have called the peninsula's faithful to worship, tolled to signal the death of monarchs, rung in rejoicing at weddings, and marked great historic events since the Napoleonic era. However, its six bells, cast in 1808 - the heaviest weighing 13cwt - now risk being silenced. Urgent restoration, to strengthen the belfry floor and repair its roof, will cost an estimated minimum of £20,000. Professional survey is on-going. The tower's Grade I listing by Historic England speaks of a significance far beyond its status as a landmark on Admiralty charts. It commands sweeping views of Plymouth Sound and the Hamoaze, and if its stones could talk, might whisper of murder within its walls (a watchman manning the signal station above the belfry, killed for his watch and silver shoe buckles). Yet much more might have been witnessed from its lofty pinnacles: Barbary pirates enslaving Cornish fishermen; Drake venturing forth against the Armada; the Mayflower setting off for the New World; Hawkins pioneering England's role in the slave trade; Nelson slipping ashore for alleged romantic assignations; French frigates anchored with impunity in Cawsand Bay; Napoleon captive on board Bellerophon; the conclusion of successful global circumnavigations by Drake and Chichester; the blitz of Plymouth, Mount Edgcumbe House in flames, and the nightly wartime anti-aircraft barrage. Preserving this bell tower, so deeply embedded in local and national history, is of paramount importance to the community. Easter Sat/Sun/Mon (April 19, 20, 21); and Saturday May 4 and Sunday May 5. Refreshments will be available. Come up and see one of East Cornwall's most splendid views. If you wish to support the appeal, please contact the bell tower captain, John Evans (meryton@gmail.com), or phone 01752 823066. 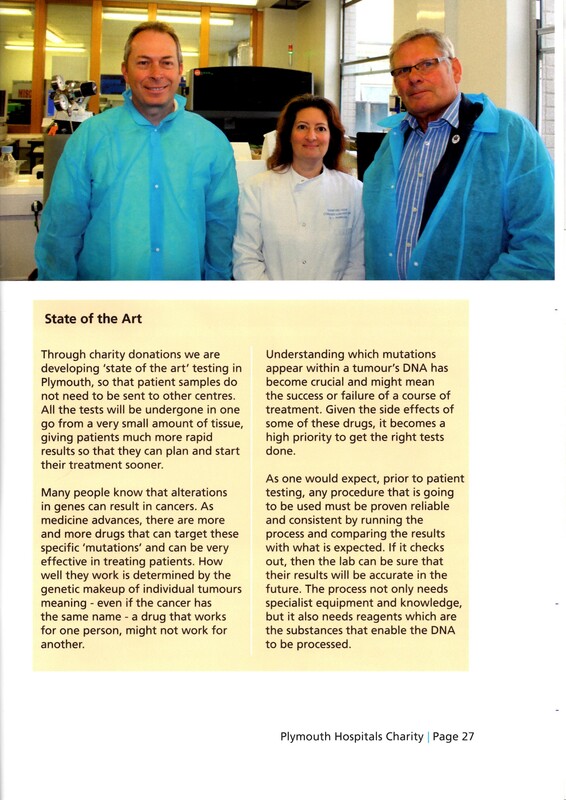 The Plymouth Hospitals Charity Annual Review 2017-2018 contains a piece about the Rame Peninsula Male Voice Choir which describes the work Derriford are doing with the technology associated with molecular scanners. Rame MVC - along with many other Cornish choirs - have made great efforts to collect a lot of money for this worthy cause. If anyone would like to donate to this worth while cause, please contact Rame Choir direct. St Stythians MVC were delighted to finish joint second in the Advanced Male Voice Choir section of the Camborne Music Festival last Saturday. In an extremely strong section, which boasted The Celtic Male Ensemble (winners), Holman Climax MVC and Kerrier MC, St Stythians rose to the occasion scoring 86;85 and 87 with their three pieces. The highest score being achieved by The River of Life, an original piece composed by Gareth Churcher and words by Bob Willmott (a top tenor with the choir). The adjudicator, Marilynne Davies, BA; Med; LRAM; PGCA; FRSA, gave detailed and informed comments on all the choirs' pieces, with a touch of wry humour. If you feel that you would enjoy spending time with a very social group of people who enjoy singing and raising money for charity then why not join us. Our practice night takes place every Tuesday night (7:45-9:30) in the schoolroom at Stithians Methodist Church, where there is plenty of parking (TR3 7AN). Please check the choir website for further details; ststythiansmvc.weebly.com or follow us on Facebook. You could also contact: Secretary: Jackie Dunstan 01872 553276; Chairman: John Houldsworth 01326 250744 or any other choir member. 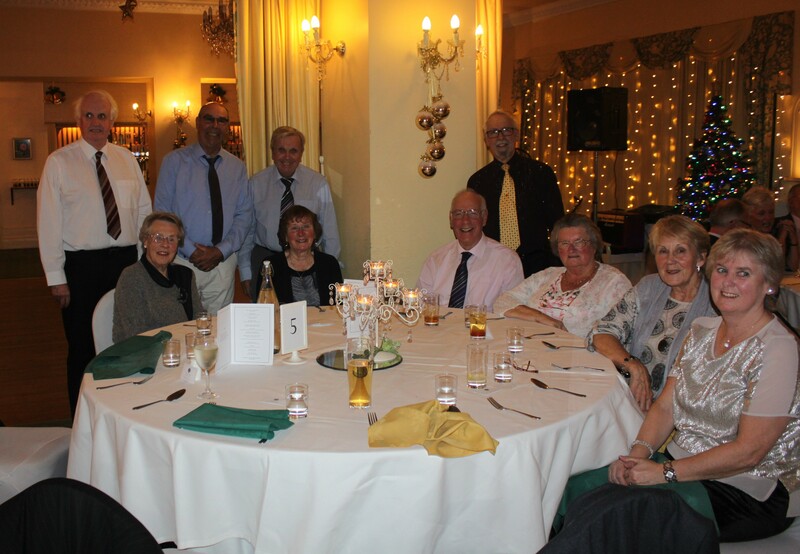 St Stythians Male Voice Choir celebrated their annual dinner at the Penmorvah Manor Hotel last Friday (23rd November). Over 70 choristers and friends enjoyed an excellent meal and were entertained by Akoustek. 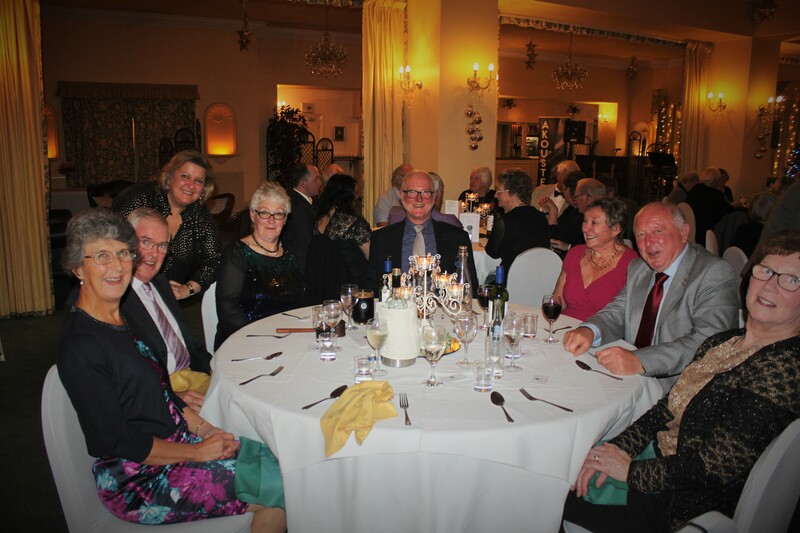 Karen Hurn and Barbara Martyn were the choir's guests of honour. Karen regaled her audience with humorous anecdotes from her musical past. 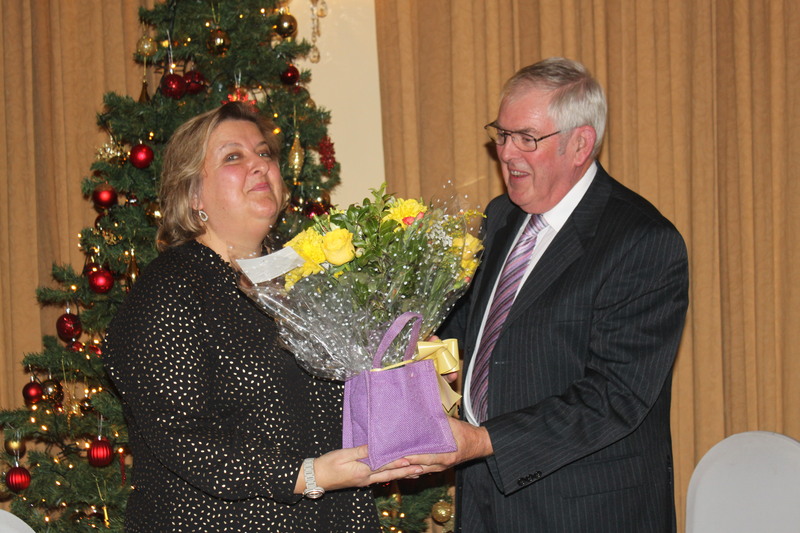 A prodigious fund raiser, Karen has used her "gift of singing" to raise approaching £200,000 for charity. Chairperson, John Houldsworth, then thanked Karen, the staff of the Penmorvah and J C Williams (Helston), the choir's main sponsor. 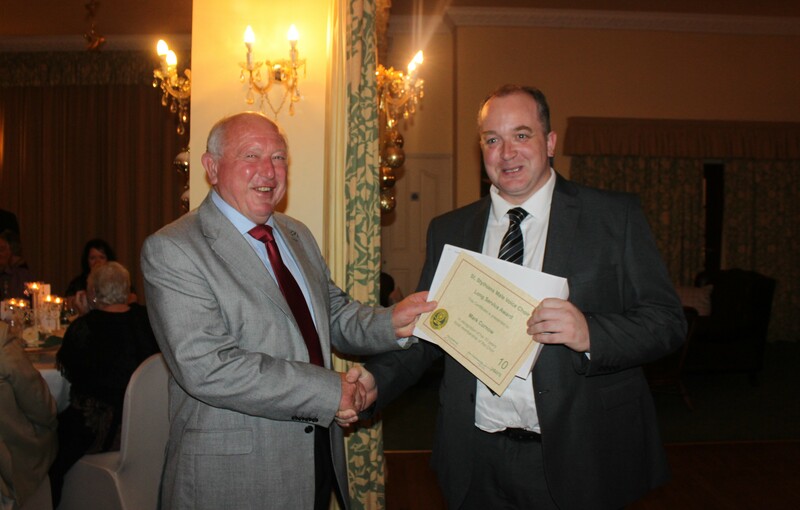 Long service awards were then presented to Mark Curnow for 10 years; John Musgrave, Mike Paddon, Glyn Pettifer, David Wilkin and Chris Dunstan for 20 years. 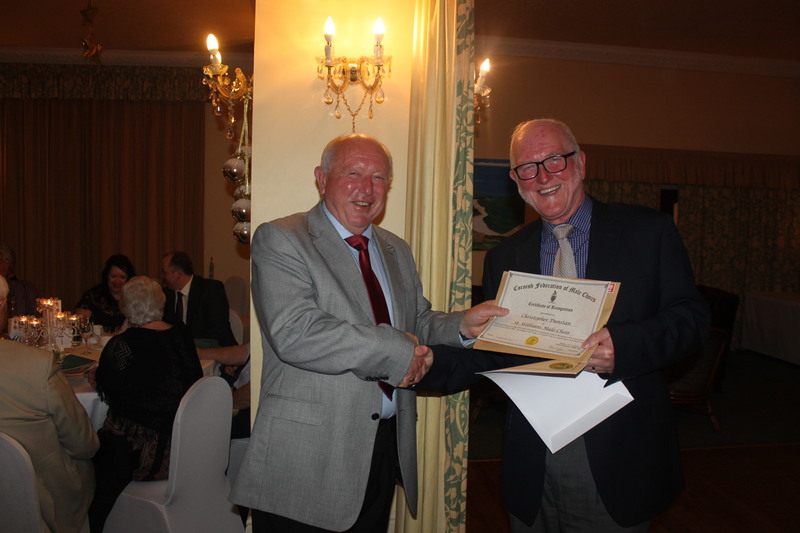 Chris was also presented with a certificate from the Cornwall Federation of Male Voice Choirs in recognition of 50 years' service, which included membership of other Cornish choirs. Flowers were then presented to Lynda Jones (Ladies committee) and Karen Hurn, as well as a special presentation to Jackie Dunstan for her efficient work as choir secretary. Once the formalities were completed, it was time to relax and socialise whilst listening to the smooth music of Akoustek. In 2016, City of Truro Male Choir appointed Russell Pascoe to be their Music Director. Since his arrival and due much to his recruiting prowess, the Choir has gained over twenty new members of all ages and is going from strength to strength. Russell was born in Cornwall and educated at Helston School and Bristol University, where he studied composition with Derek Bourgeois. In 1987 he founded the Cornwall Youth Chamber Choir and was awarded the Gorsedd prize. 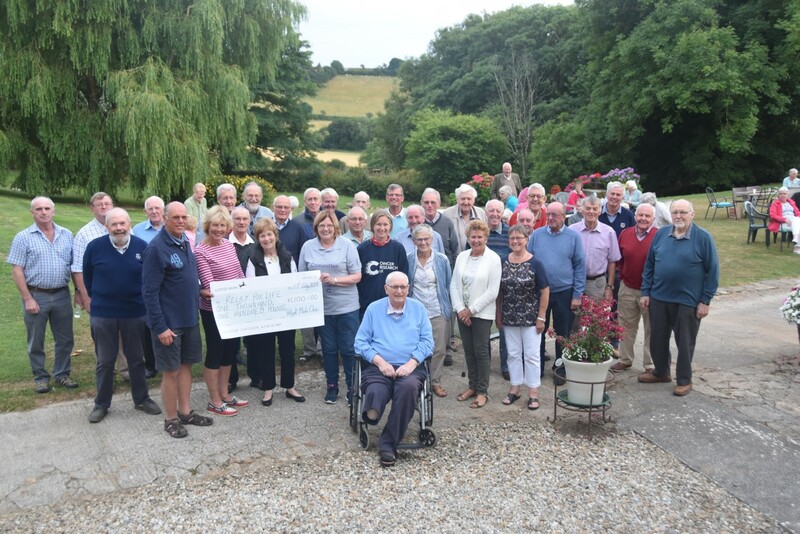 He also worked with the Cornwall Male Voice Choir, Duchy Opera and ran five school based choirs including the popular 'Cousin Jacks' choir for boys at Richard Lander School in Truro. As a composer, Russell has had his music performed from Finland to Mexico and has produced music in most genres; opera, orchestral, chamber and choral. He has taught composition for the South West Music School and in 2000 was nominated as one of Classic FM's Music Teachers of the Year. He was runner-up in the South West Teacher of the Year 2004 and was made a Bard of the Cornish Gorsedd in 2000. Since his appointment as Music Director for Truro's Male Voice Choir, Russell has led the choir in numerous concerts throughout Cornwall, including the Cornwall Music Festival, where the choir were awarded a Distinction. Russell says. 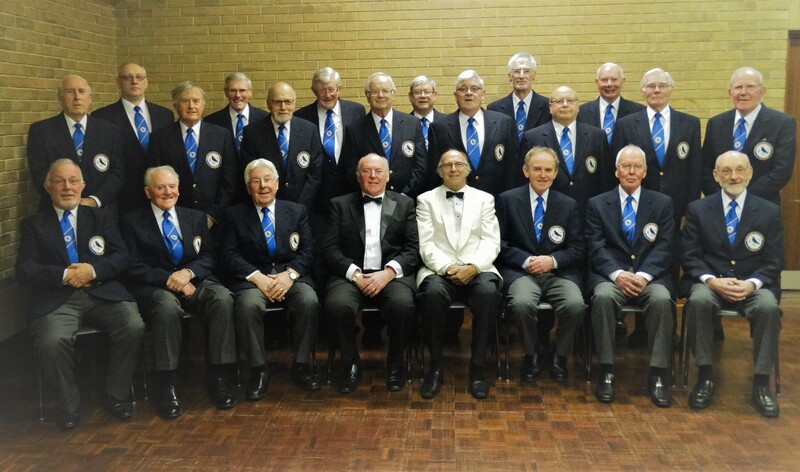 'As a proud Cornishman, it is a great honour to conduct City of Truro Male Choir ­ a choir in the heart of Cornwall. It is a great opportunity forge a community of singers and to let them enjoy singing in concerts and purely for fun in pubs! 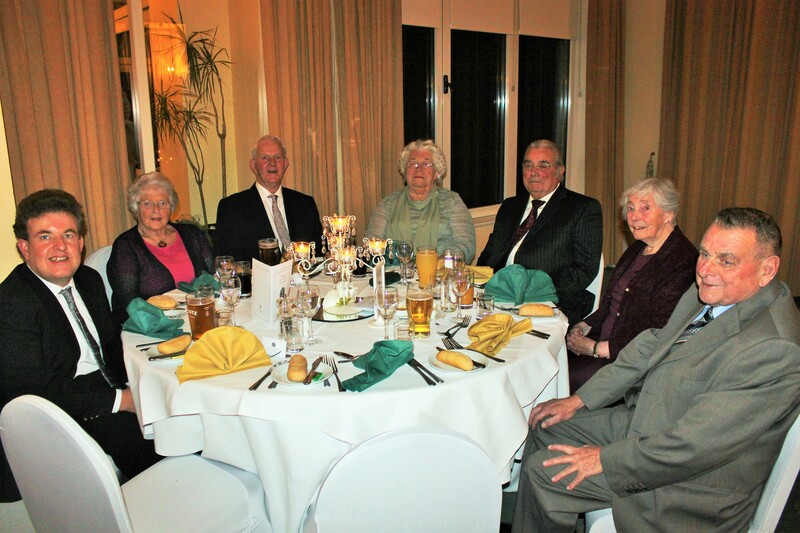 It is fantastic that we have been able to engage so many new members of varied ages'. The choir practices at All Saints Church, Highertown, Truro on Thursday nights at 7.30PM. They offer a friendly and supportive environment in which to enjoy singing. Our website and Facebook page show us in action. Members of Mevagissey Male Choir are sad to announce the death of their much loved accompanist for many years, Brian Mitchell . Brian died on Sunday 15 July. He was well known all over the county for his organ playing, and his quiet unassuming manner. The choir is delighted to announce that its Director of Music, Rosemary Cole has been recognised in the 2018 Queen's Birthday Honours List with the award of a British Empire Medal for services to singing and the performing arts in the South West. Rosemary was the main instigator in forming the choir in 2006 with just 9 members. A member of the Cornish Federation of Male Voice Choirs, the choir now has around 40 members and thanks largely to the her hard work and talents the choir has a very full programme of successful concerts which includes the traditional male voice repertoire and modern compositions both sacred and secular. At the end of January the Federation received a request from the Lord Chamberlains Office at Buckingham Palace, inviting members of the Executive Committee to attend a garden party to celebrate the 70th Birthday of Prince Charles, Duke of Cornwall on the 22nd May 2018. After contacting the Executive Committee, names were forwarded to the Palace and in due course official invitations were received. We were told not to inform anybody of this event because of the security involvement for the day. On the day we all had an early start, meeting at Plymouth railway station to catch the 9:49 train to London. The journey was uneventful, but some of the passengers on the train were from Cornwall and also going to the party. We then made our way to the Palace arriving at around 2:30 pm for the gates to open at 3:00pm. On entering the Palace Gardens we had time to look around the vast gardens, making our way to the lawn area, to join up with the other 6500 guests for the event. All the guests were involved with organisations that Prince Charles was patron of. At the appointed time of 4:00pm a fanfare heralded the arrival of the Royal Party including the Duke and Duchess of Cornwall, Prince Harry and his new bride Meghan, (Duke and Duchess of Sussex). Prince Harry started the proceedings with a speech explaining what the day was about, during his speech a bee happened to sting him on the neck; his subsequent comment caused much amusement. The Royal Party proceeded down the steps, for a group photograph with all of the officers of the organizations that they are involved with as Patrons. The attending throng formed two lines on the lawn for the Royal Party, so that they could walk down chatting and shaking hands with as many people as possible. At this time the tea tent was opened for sandwiches/cakes tea or coffee (very nice!). The rest of the afternoon in very hot weather was spent chatting with people from all over the World enjoying the event. The party finished at 6:00pm and we made our way back to Paddington station to catch our train at 20:03 due to return to Plymouth at 23:25. We were on time all the way until rail works near Ivybridge held us up for 35 minutes, getting home later than expected. But a great day was had by all. 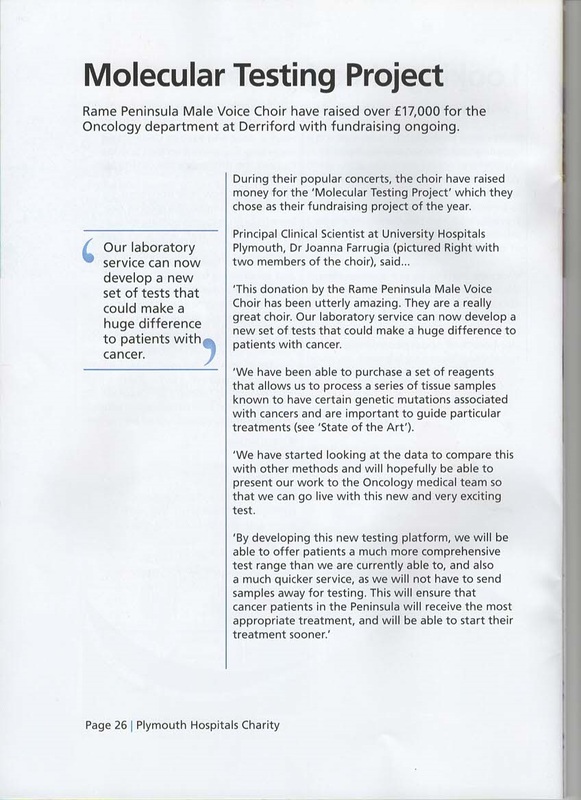 Report by Ted Pinguey Publicity Officer for The Cornish Federation of Male Voice Choirs. 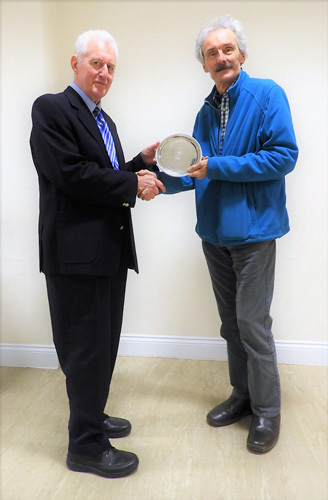 At the Federation Annual General Meeting held on 17th April, City of Truro Male Choir was announced as the winner of this year's President Plate Award. The Chairman, Terry Hodge, congratulated the choir on their excellent work within the community and their youth involvement. The choir always try to be part of the local community, here are a few things they have been involved in during the past year. 1 Lady Mary Holborow Memorial Service at Truro Cathedral. 2 Singing at the bandstand of Victoria Gardens, Truro on two occasions as the Britain in Bloom Judges visited. 3 Participating in the Truro Day Celebrations. 4 Supporting Tregthnan Estate Charity Open Day. 5 Supporting Trewithwen Gardens Charity Open Day. 6 St Pirans Day Shot at the Rising Sun Pub. 7 Carols at Tregolls Manor Retirement home. 8 Managed all the choir competition and concert marshaling at the HFC during the International Festival. There youth involvement is working with local schools and held a St Pirans Day Concert with Threemilestone Primary School Choir and supported them with their Christmas Concerts. they held a joint concert with Truro School Wind Band and their Barbershop Choir. They have also recruited younger singers and now have 7 members of the choir in the range of 13 - 21. Burraton Male Choir proudly showing off their new uniform just before their first concert of 2018. St Piran's Day Concert at Saltash Wesley Methodist Church in aid of Little Thing & Co., The Baby Bereavement Charity. The concert raised over £600 for the charity. 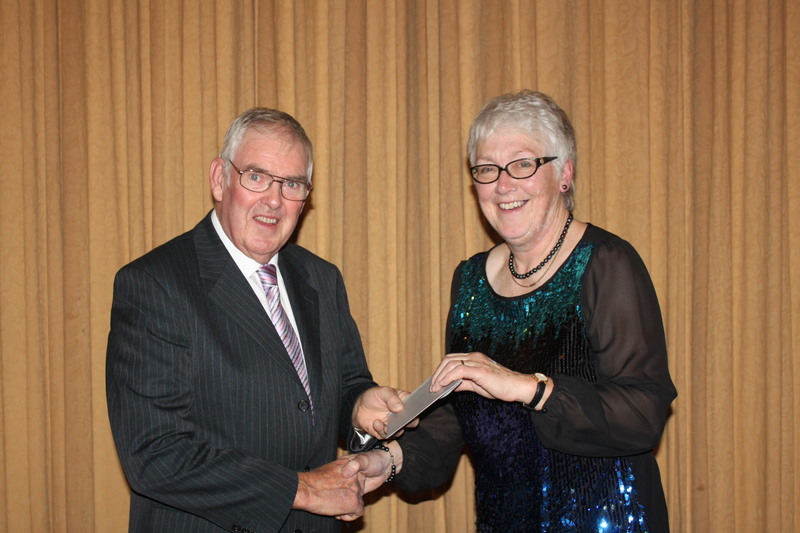 At the beginning of December, City of Truro Male Choir President Geoff Aver presented long service awards to choir members. Denzil Oates and John Harris, seen either side of the President, have been singing continuously with the choir for seventy and fifty years respectively. With the other awards the accumulated singing time for the five members, comes to one hundred and seventy years. Denzil joined the original Chacewater choir in 1947 and says he is looking forward to the next ten years. He was also Chairman for thirty years. Below is a very intersting article sent by Linda and Tom Jones after a visit to London. On a recent visit to London, we discovered an interesting fact about Burlington House, home of the Royal Academy: Burlington House cornices have something surprising and special about them! The main (north) building of what is now Burlington House in London’s Piccadilly was built as a private residence in the early 1700s. East and west wings were subsequently added, and it was eventually sold to the British government in 1854 for £140,000. It was renovated by the architect Sydney Smirke RA who replaced the east and west wings with larger structures, but left the main building largely intact. The main building was then leased to the Royal Academy of Arts in 1868. During the renovation process, complex moulded cornices were fitted to ceilings in the main galleries. 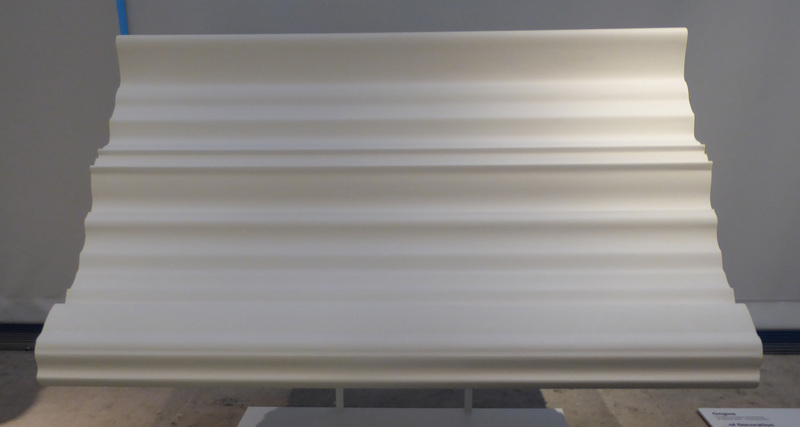 Fragments of these cornices were on show at a recent exhibition in the RA. The first photograph shows what appears to be a typically complex cornice - fit for a palace. 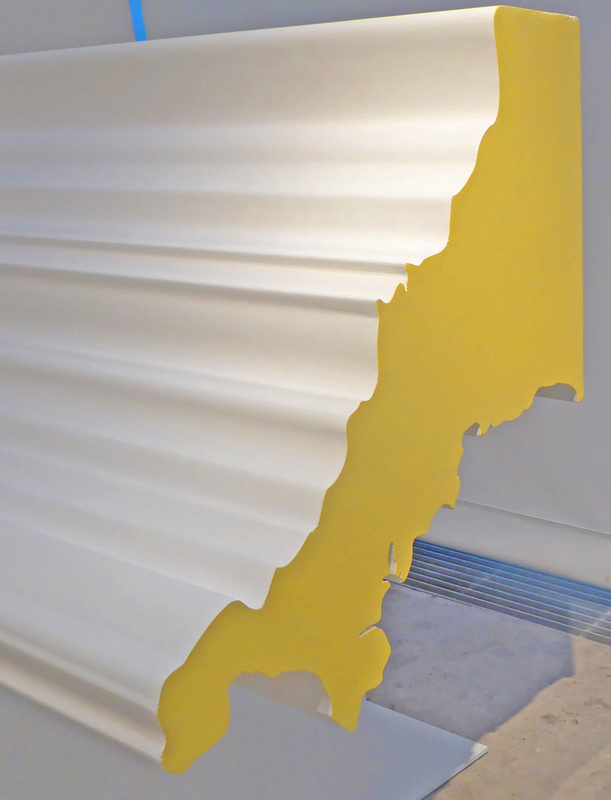 However, the second photograph shows its edge profile which is a beautiful replica of … a map of Cornwall! For years now I've been trying to track down a recording of this Songs of Praise from Truro cathedral in 1992, my VHS went haywire and I have a very poor quality tape.I have a good recording of the later Songs of Praise, but in my view it's not a patch on the earlier one. Is a similar event planned for 2017 ? I realise this was a BBC event but I wondered if recordings still exist and are available to buy. Many thanks in anticipation. 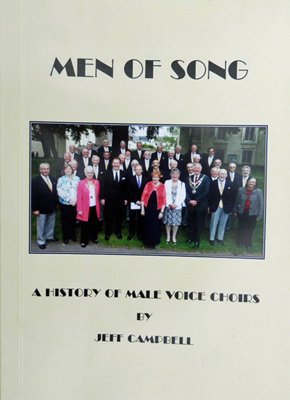 Men of Song, written by Jeff Campbell, sets out the history of British male voice singing; it is a book likely to be be of great interest to male voice choristers and fans of choral singing around the UK. Jeff Campbell has dedicated his time to researching his book, a subject about which he is passionate. He also decided he would like this project to be a means of helping his 11 year old granddaughter, Skye Campbell, who suffers from Down's Syndrome together with some serious health complications including a heart condition. Skye attends the Bidwell Brook School, a special school which Jeff states does wonderful work with the children. He intends to give any proceeds from the sale of his book to a fund to assist his granddaughter's future. The paperback contains 344 pages with full colour pictures. It is available now from Jeff direct priced £11 this includes post and packaging or Ebay priced £12, both can be payed for by using PayPal. For further details please contact Jeff on 01548 831559 or email to menofsong2016@gmail.com. 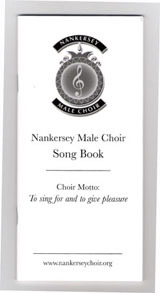 A new Song Book has been compiled by members of Nankersey Male Choir. The Song Book contains 51 well known songs and hymns and is intended to be used on informal occasions (possibly with a pint in hand!) whenever choir members get together for a sing song outside of concert "conditions". It is also intended to act as an aide memoire for those who find themselves at a loss to join in because the words are either unknown or temporarily forgotten! Thanks to everyone who has helped in the compilation. We are pricing the Song Book competitively at £2.50 only and this must represent good value as it is handily sized for placing in a jacket pocket and the cover is laminated for durability. The Song Book is dedicated to Nankersey's 12 founder members and a photograph of those worthy gentlemen appears in the book. Neil Shepherd, MD of "Laudate!" 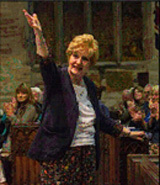 and also a qualified travel agent and tour operator has kindly offered suggestions and advice to choirs planning tours. This item first posted June 2009 and retained for reference. Click on the link below.